The situation in the Syrian rebel-held stronghold of Eastern Ghouta remains tense, despite the February 24 UNSC resolution urging all parties to adhere to a long-term humanitarian pause across the country in order to ensure the safe and unhindered delivery of humanitarian aid and medical evacuations of the injured. 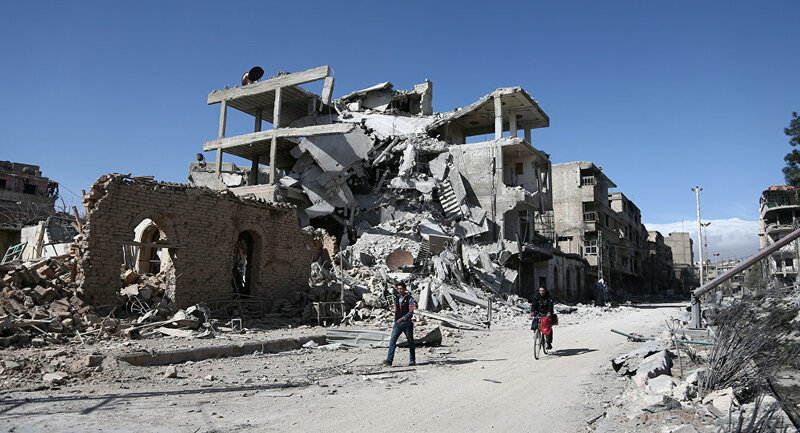 The first group of evacuees, including 13 al-Nusra Front* terrorists and members of their families, has left Syria's Eastern Ghouta a day after the Syrian authorities opened a second humanitarian corridor, SANA news agency has reported. The militants, who had been held in prison by rival terror group Jaish al-Islam, will be relocated to the Syrian northeastern province of Idlib. According to the agency, the militants continue shelling the evacuation passages of al-Wafideen and Jisreen, preventing civilians from leaving the terrorist-held area. The video uploaded on the Internet shows security services inspecting the militants and their luggage and then escorting them to a special bus. Jaish al-Islam said in a Twitter message the day before that the decision to release al-Nusra Front terrorists had been taken with the mediation of the UN and local civil society representatives. Last week, The Russian center for Syrian reconciliation said, citing the Syrian military, that the militants in Eastern Ghouta promised to release the civilians in exchange for humanitarian aid. The announcement was made shortly after some 45 trucks with humanitarian aid and a mobile hospital lined up at the checkpoint in the Muhayam-Al-Wafedin settlement, where the humanitarian corridor toward Eastern Ghouta begins. The aid included food, medicine and basic necessities with a total weight of 247 tonnes.